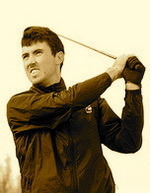 Kearney was joint top scorer for Great Britain and Ireland at last year’s Walker Cup and turned professional. He narrowly failed to earn his full European Tour card at the Qualifying School but did enough to pick up a priceless Challenge Tour ticket. That gives him a chance to earn promotion to the big leagues in 2011 and rub shoulders with his former Ireland amateur team mates Rory McIlroy and Shane Lowry . But he’s not putting himself under pressure and hopes that his relaxed approach will pay dividends as he learns his trade this year. He said: “I think the Qualifying School was good for my confidence. I went out with a nothing to lose attitude and had no expectations. “It worked out well because I just went out to enjoy it and I plan to do the same this week." Kearney has joined Ryder Cup star Graeme McDowell in the growing Horizon Sports Management stable. And his decision to sign with the Dublin agency has paid off straight away with a precious sponsor’s invitation to tee it up alongside Darren Clarke, Gareth Maybin, Michael Hoey and Gary Murphy at East London. The Challenge Tour does not begin for several weeks and Kearney can’t wait to set his professional career in motion with the sun on his back. He said: “The weather has been so miserable at home that I haven’t been able to hit balls for a few weeks. Veteran Clarke, 41, has his sights set on earning his sixth Ryder Cup cap in his 20th season on tour. Making Colin Montgomerie’s Ryder side is at the top of his wish list but he knows that he has to “get back in the winners' enclosure sooner rather than later” if he is to face the Americans again.